As many of you know, we have been using My Father's World since Kindergarten. We really love them, and can't imagine using other curriculum. That said, there are always some parts of each year that work for our family, and some that don't. Please take these as just our experience. Your family may seem of our pros as cons, or vice versa. History We always love the History sections of MFW, and it is usually my favorite part of the teacher's manual. Story of the U.S. and American Pioneers and Patriots were great living books, each week my kids asking to read more than assigned for that day. The books were very age appropriate and kept them engaged. 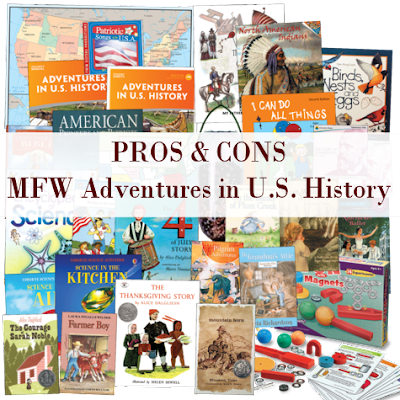 The many other History books, such as North American Indians, were all very kid friendly and informative. The student sheets and sticker books were also fun, and very easy to use. We still use the map placement in school, almost every day. Bible Learning the names of Jesus was informative, and always tied easily with s science lesson. For example, when we learned that Jesus was the Bread of Life, we also learned about yeast. The Bible Memory wasn't too daunting this year, like we have seen in later years of the family cycle. The Book First Encyclopedia of Science was very fun, and kid friendly. We also printed a list of Magic School bus episodes, found on MFW facebook page. We also enjoy the student sheets and the Bird Nature Study using Birds, Nests, and Eggs because it actually tied to the study of the states. Each time you study a state bird, you study that bird. We went on several nature walks, but were never that great about note booking. The Fun with Magnets set was also used a lot, but mostly in just free exploration. We like Language Lessons for Today. We really enjoy the gentle introduction to English and grammar. We tried a traditional approach on recommendation from a friend, and it was way too much repetition for us. Spelling by Sound and Structure has also been a wonderful curriculum that goes perfectly with our second grade workboxes. Music appreciation lessons that focused on Tchaikovsky's Nutcracker were fun, and went along with our field trip to see the Nutcracker (in the Deluxe Package). We listed to the CDs while we colored the History Student Sheets. In the student sheets & on a CD, you get to learn some simple patriotic songs that were very fun. Read-Alouds These were almost a Con. The books themselves (The Courage of Sarah, Noble On the Banks of Plum Creek, Sarah Whitcher's Story, In Grandma's Attic, Mountain Born, Farmer Boy) were all great, but we never seemed to get to them during the day, so I started a chapter at bedtime. When that didn't work on a consistent schedule, we got them them in audio book from the library and it turned them into a Pro! Farmer Boy was our favorite, especially if you have young boys. This was great for along car ride to our in-laws, or for playing while my kids ate their lunch. Book Basket This year's book basket list was well done and we used at least a few of the books every week. I do not read these books to the kids, they read themselves from the library basket. The books from each state always helped them go into more depth than I could manage to fit in during our Together Time. Like always, I use it as my jumping off point for my library search. I reserve all my books online, and pick them up once every 2 weeks. Art I Can Do All Things (in the Deluxe Package) wasn't for us.We did about half of the beginning lessons, and they were interesting, but we just never got that into these lessons. Granted,m we didn't have the DVDs. 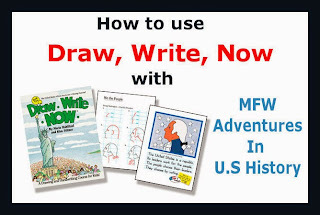 We stopped, and switched to Draw Write Now , which my kids LOVED; so much that we ended up using all through third grade Exploring Countries and Cultures . Math We have never had great luck with MFW recommend Math. We use Math U See, you can see our review here. Science Science in the Kitchen and Science with Air. We also didn't use the Soda Bottle Bird Feeder, and just used Toilet Paper Rolls, with peanut butter and bird seed. These books never connected to the curriclum, and just didn't' seem like they had much meaning or depth. Stack the States App -Inexpensive app that we used ALL THE TIME. My husband and I even play on it a lot! Scrambled States - Simple board game about America, so easy that 2nd graders can play easily without much assistance after first time. Liberty's Kids - The Complete Series - Great for sick days, and on those long winter days stuck inside! Thank you for using affiliate links, they help keep the blog open at no extra cost to you.